Ted Loewen of Blossom Bluff Orchards was looking forward to one of the best mandarin crops he’d seen in years. The trees were laden with fruit when the cold snap hit the San Joaquin Valley on December 6, sending temperatures into the low 20s. “We suspected we had some pretty significant damage,” says Ted. “We still don’t know the exact amount, but it looks like it got most of the Gold Nuggets.” Usually a year-round fixture at the Saturday Ferry Plaza Farmers Market, his farm has pulled out for the winter and may not be back until stone fruit season begins in May. Though seemingly mild compared to the sub-zero temperatures experienced in other parts of the country, a recent hard freeze has taken its toll on the California citrus industry, which supplies 85% of the country’s fresh citrus. The trade group California Citrus Mutual has called it the “earliest severe freeze for Valley citrus growers in over 25 years.” As farms big and small reel from the blow and take stock, counties are still assessing the damage to the $2 billion industry. In addition to Blossom Bluff, other small, diversified farms at the Ferry Plaza Farmers Market have been bitten by the frost. With less citrus to sell this season, Tory Farms has kept a presence at the Saturday market but dropped out of Thursdays. “The bad news was the Page mandarins, which are usually our biggest seller,” says Tory Torosian. “They’re done—90% frozen. We usually have about 400 boxes in a year, and this year it was about 30.” While he is optimistic about his Oro Blanco grapefruits and Satsuma mandarins, he’s still waiting to see how his orange crop weathered the freeze. 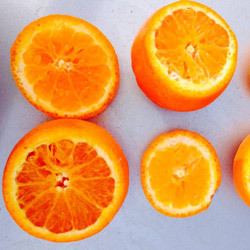 Thin-skinned citrus like mandarins tend to be susceptible to cold damage, while thicker-skinned varieties like navels are more cold-hardy, withstanding temperatures as low as 27 degrees. High sugar content can also increase a fruit’s cold tolerance. While a certain amount of cold helps the sugars in citrus develop, too much for too long can destroy a crop. Ice forms inside the fruit’s tissues, causing them to burst. As the fruit loses its moisture through the broken membranes, it begins to dry out. “The flavor changes, it gets bitter, and it’s not as juicy,” says Tory. 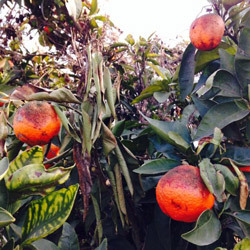 Citrus farms have various frost protection strategies in their arsenal, but most are costly and can be a heavy drain on energy and resources. Larger farms may use orchard heaters or wind machines that pull warm air down into the grove, creating an “inversion layer” that raises temperatures by five or more degrees. Such machines rely on natural gas, diesel, or propane. On the low-tech end of the spectrum, farmers can run sprinklers directly on the trees, creating an ice layer that buffers fruit through a phenomenon known as “heat of fusion.” (Watch a video by farmer Nigel Walker of Eatwell Farm.) Farmers can also flood their orchards to retain warmth and create an insulating fog or steam. But such water-intensive methods can only raise temperatures by a degree or two, and they are not ideal for arid California, especially during what could be the worst drought in four decades. “We ran water in our orchards every night for a month to help protect the trees, and our biggest concern right now is water,” said Yukio Hamada of Hamada Farms. He estimates that they lost 30 to 50% of their citrus during the freeze. “There’s still good fruit out there, but we’ve got to be selective, and that takes a lot of time because we do all of our picking by hand.” While some larger packing houses have machines that can sort out bad fruit, many farms manually inspect by piece, cutting samples to check for damage or floating fruit in water. Large citrus growers have been selling off damaged citrus for juicing to recoup harvest costs, an option that may not be available to farms with smaller quantities of fruit. “I think we’re small enough volume that it would be hard to get any interest,” says Ted of Blossom Bluff. Planning for the worst, John Lagier and Casey Havre of Lagier Ranches got much of their citrus off the trees a few days before the frost hit. They were able to salvage their Meyer lemons to process into spreads for Saint Benoit Creamery’s yogurts. They have also been selling their cold-damaged mandarins at a discount for juicing, which has helped them to recover some of their losses. “You do what you gotta do,” says John. Support your farmers throughout the winter season! 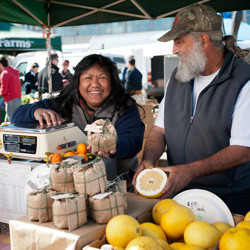 The Ferry Plaza Farmers Market is open three days a week, year round. Icy citrus photo by Eatwell Farm. Damaged citrus photos by Tory Farms. Rebecca and Tory Torosian photo by Gary Yost Photography.